If you think Easter outreach is limited to an egg hunt or a preschool passion play – think again! Easter is an excellent time to grow the church in new and exciting ways. Sometimes a multi-pronged strategy is best, especially if you want to reach different areas. These four Easter outreach ideas make good tools for getting into the local soul harvest. Take your community by storm with these Easter outreaches. Sidewalk Art Festival: This idea came about after a group of kids began sending me pictures of their sidewalk chart art. I realized we had some great talent in our church! Fortunately for me, the church had massive sidewalks and plenty of safe spaces for artists. That Sunday, during children’s church, kids smocked up and drew pictures of Easter scenes. We shared the Easter story for a few weeks previously to inspire kids with the story of Jesus’ death and resurrection. The results were wonderfully artistic. After church, the congregation took a stroll down to the sidewalks to vote on their favorite scenes. Everyone was a winner and took home a chocolate treat; however the winner received a big blue ribbon. Tricycle/Bicycle Parade: Kids dressed up their trikes and bikes for this Easter outreach idea. We had bunnies hanging out of baskets, crepe paper taped to handles and kids wearing funny costumes. With the music pumping, kids toured the parking lot waving to the passersby and the congregation that gathered to applaud. We love this idea. 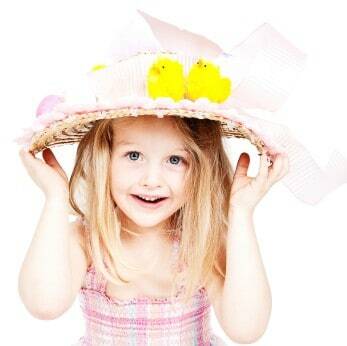 Sunday Hat Parade: This mini Easter outreach drew a lot of craft lovers, young and old. In the weeks leading up to Easter, we had a few craft nights. Moms and daughters came to create hats for the parade. During Easter, they strolled around before service to show off their creations. The hat parade is now a regular part of our Easter Sunday Service, just like the one that inspired the song. Easter Bake Off: This Easter outreach idea is delicious! Put your church’s baking skills to the test with an Easter Bake Off. Encourage members to bake an extra dessert and bring it to church Easter Sunday. All guests have to do is to show up. Guests’ name go in a hat and the Pastor or some other leader draws the names. It’s good to pick the treat and hold up the dessert, rather let everyone choose for themselves, especially if you have a lot guests. If not, it will take forever to distribute all the treats and some bakers might get their feelings hurt. I love this Easter outreach idea! Read Mimi’s parable, The Young Boy and the Great Mountain or visit her blog at Encouragement for Christians. Mimi Bullock has served in ministry for over 15 years. She is the author of four books and hundreds of children's ministry lessons. You'll find her work full of creativity and passion for kids to know Jesus personally. Tony Kummer (Editor) reviewed & updated this page on : August 31, 2017 at 12:58 pm. All our content is peer reviewed by our readers, simply leave a comment on any post suggest an update.